This is an operation to close a hole in the ear drum. There are many different ways of performing this operation, but generally Mr Vik Veer prefers to avoid any scars around the ear, keeping all the incisions within the ear canal. This seems to be less painful for patients and also avoids shaving any hair or leaving any scars. An ear drum perforation can occur for a number of different reasons. Occasionally this is because of injury to the ear drum from something pushed through the delicate membrane such as a cotton bud or hair pin. More commonly a perforation occurs because of a infection in the middle ear which tears through the ear drum. Generally this ear infection leads to terrible pain and hearing loss in the ear followed by a sudden discharge of pus from that ear. After a day or so the pain improves but there is still hearing loss and sometimes discharge from the ear. Often patients with discharge from the ear are given oral antibiotics, but in actual fact you should be given antibiotic ear drops. There is good evidence that drops are the right treatment, and there are drops that do not cause hearing loss. 98% of Ear drum perforations heal up within 3 months, so before considering an operation for this, patients should wait for 3 months at least. The most common operation in England for ear drum performation is called the underlay tympanoplasty. This operation can be done without any scars outside the ear, but in some types of perforations (those that are difficult to see), need to be repaired with a scar either infront of the ear (rare) or behind the ear. As you can see a layer of fascia is used to support the hole in the ear drum. Fascia in medical terms is a thin layer of tissue found on the surface of muscle or cartilage. This fascia can be collected from cartilage or muscles around the ear and used to cover the hole in the ear. This fascia acts as a support for the perforation, it doesn't actually plug the hole. The fascia will eventually reabsorb over several months. The way the operation works is that the hole in the ear drum is altered in such a way that it starts healing again. This healing process is more likely to work if there is something for the ear drum to grow across. This is what the fascia is used for, as a scaffolding for the healing ear drum. 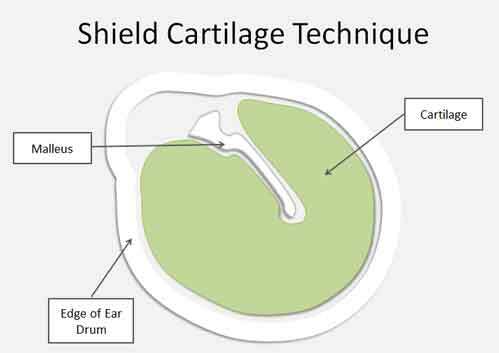 Sometimes the ear drum can be further supported with a piece of cartilage (green block), which lasts much longer than fascia and means that the success rate of blocking the ear perforation is higher. Having a piece of cartilage in the ear however may mean that the hearing is not as good as a normal as just fascia. Cartilage is normally recommended in ears which keep getting infected or where the patient finds it difficult to pop the ears. OnLay is a poor way of describing this operation. 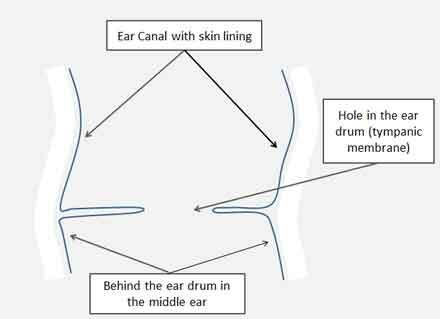 In actual fact the skin that lines the ear canal and the skin on the other side of the ear drum (that covers the middle ear) are separated and the space between them is seen. The fasica is then placed inbetween the layers of the ear drum (like a sandwich), and allowed to heal that way. 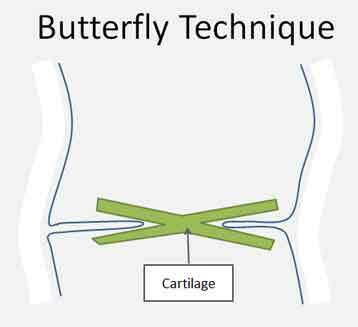 Occasionally you can use cartilage in this technique as well. This type of operation is rarely done in this country, but this technique is very common in America. 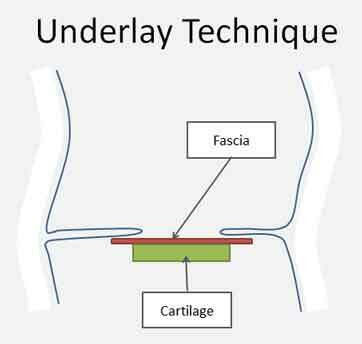 Mr Vik Veer uses both onlay and underlay techniques frequently, and the decision is normally made during the operation. This technique is rarely used. Mr Vik Veer uses this to plug a hole, rather than allow the natural healing of the ear drum. This operation is useful in cases when a simple operation is needed to avoid a long general anaesthetic. The hearing outcomes aren't quite as good, but it is a quick operation and you do not need to rely on the healing of the ear drum for the operation to work. This operation is especially useful for patients who are completely fed up as they have had lots of operations with no success. Again the decision to go ahead with this operation is only really made during the operation, but the pros and cons can be discussed beforehand. 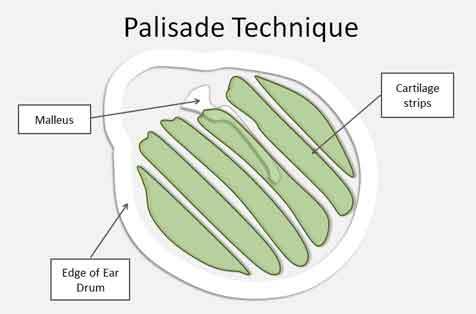 The Palisade technique is an attempt to reduce the bulk of the cartilage to give even better hearing results whilst also providing the benefits of using cartilage. The best of both worlds. Again this decision is made during the operation, but this technique and the many others that are not recorded here can be discussed in clinic.